One problem: Sarah Silverman does not drink. (Why am I always surprised by people who don’t drink? I look at them and go, what must their lives be like? That can’t say anything good about my own habits.) She does, however, smoke pot. Always the cordial host, Hannah put aside her highball glasses and got baked — onscreen. Okay, guys, first of all, have you seen MDK? She’s not drinking Capri-Suns. Alcohol is a drug (that was the first thing they taught us in DARE!) 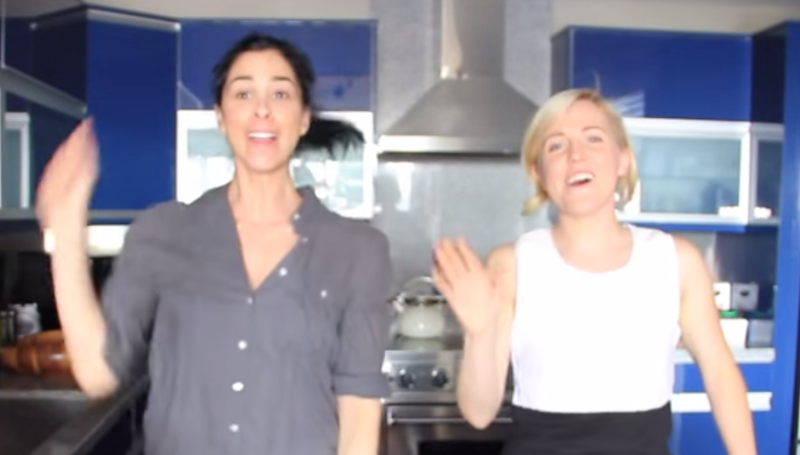 and My Drunk Kitchen is a webseries for adults. Secondly, if teenagers are watching…I don’t smoke myself, but having survived high school, I can safely say that when it comes to pot, teenagers are the ones who are a bad influence on us. They’re the ones making pot look easy to get ahold of, pretty fun, and maybe even a little more consequence-free than alcohol. It comes down to this. If a teenager wants to smoke pot, she’s going to. If she likes it, she’ll keep doing it. If she gets paranoid as hell, like Queer Girl, she won’t. But one way or another, Hannah Hart isn’t going to influence her choices. Honestly, I would be far more worried about how exciting Hannah makes it look to fry things in oil when you’ve had five Old Fashioneds. DON’T DO THAT, KIDS. Just back away from the frying pan. I can’t even fry in oil sober without burning myself. Although, that could just be me. Check out the episode below. Do you think she crossed a line?